DONETSK, Ukraine -- A very interesting success and surprise in the anti-terrorist operation in Donetsk. Ukrainian helicopter attacking pro-Russian rebels at Donetsk Airport. It has now been learned that a very senior (and dangerous) career Russian special forces officer, Sergei Zhdanovych, was killed by Ukrainian Spetsnaz forces at Donetsk Airport on May 26th. Zhanovych was a veteran special forces operator in Afghanistan and in the wars in Chechnya. Until recently, he served as a senior instructor at the elite Center for Special Operations of the FSB of the Russian Federation, training comparable to that of U.S. Navy SEALS or U.S. Army Special Forces. He arrived in Ukraine from Rostov-on-Don, Russia on May 19th. When you put this together with the fact that significant numbers of the Chechens killed at Donetsk airport in the operation turned out not to be mere Kadyrov mercenaries but, current serving members of the 4th Company of the "Vostok" Battalion of the SPOR of the Russian Ministry of Internal Affairs, it becomes very clear that Russia committed its elite special forces personnel directly to a special mission in Donetsk. This may have involved something much more significant than yet another "separatist" building takeover. Why try to take over the Donetsk airport? In Prague, Czechoslovakia in 1968 the Soviet invasion began with a takeover of the airport tower followed by landings of Antonov troop transports bringing in Soviet paratroops who then proceeded to the capital to overthrow Dubcek. On December 25th, 1979 the Soviet invasion of Afghanistan began with landing of airborne troops in Kabul. 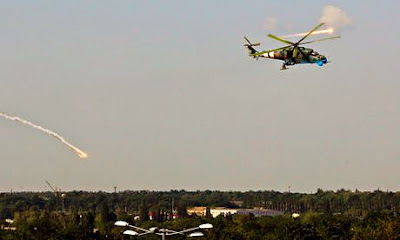 Given who Zhdanovych was, it is conceivable that if the Ukrainian forces had not acted decisively and promptly at Donetsk and Russian special forces had managed to take control of the airport, Russian airborne forces could at some point have spearheaded an invasion to split the country into two as Putin has planned and even, bring in the deposed Yanukovych from Rostov-on-Don to his hometown of Donetsk as a puppet ruler for the new "Novorussia Republic" they have been trying to set up. We may never know what the special mission was really about but, the action of Ukraine's anti-terrorist forces may have saved the country from something very terrible.